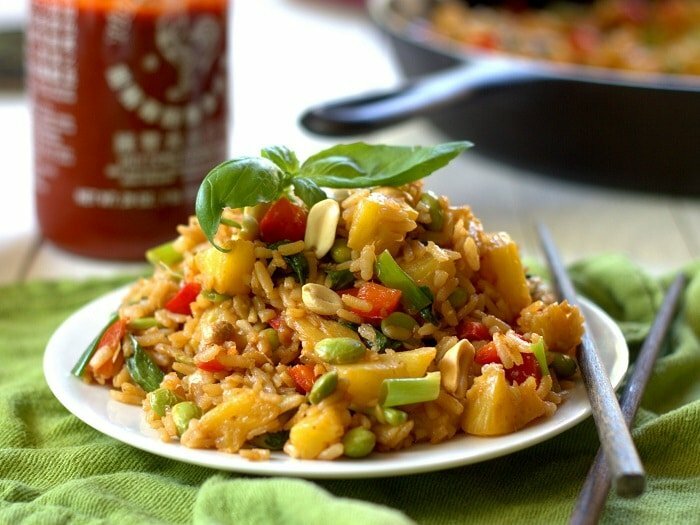 Juicy pineapple chunks are simmered with garlic and ginger and then stir-fried with crispy rice, edamame and fresh basil in this peanut-topped pineapple fried rice. I’ve had a little problem with planning my blog posts of late. Earlier this year I developed an inflammation in my right hand. I’d wake up in the morning with my hand clenched up and my middle finger wouldn’t unclench without a good deal of coaxing and pain. I found out from my dad that this is genetic. I found out from the internet that a splint holding the afflicted finger in an extended position was the fix. I’m happy to say that the splint seems to be working. The pain is almost gone and I’m hoping that in a few more weeks I’ll be able to take it off and wake up in the morning to a fully mobile hand. In the meantime, I have to be careful not to inadvertently make obscene gestures when doing things like, say picking up a coffee cup in public. And I can’t read my own handwriting. Somehow, typing isn’t too bad with an extended middle finger, but writing anything coherent is damn near impossible. How does this play into my blog postings? I keep a little notebook on hand where I scribble down blog ideas when they pop into my head, which is frequently and can happen anytime, anywhere. I can’t read a single thing I’ve written in the last month. Does this say “pineapple fried rice”? I have no idea, but that’s brilliant. Sounds delicious, and I could use a little pineapple anti-inflammatory action to help this hand issue along. Done. So that’s how we ended up here, at pineapple fried rice. The basil and peanuts made their way in there just because they’re delicious, and they go great with pineapple, so why not? 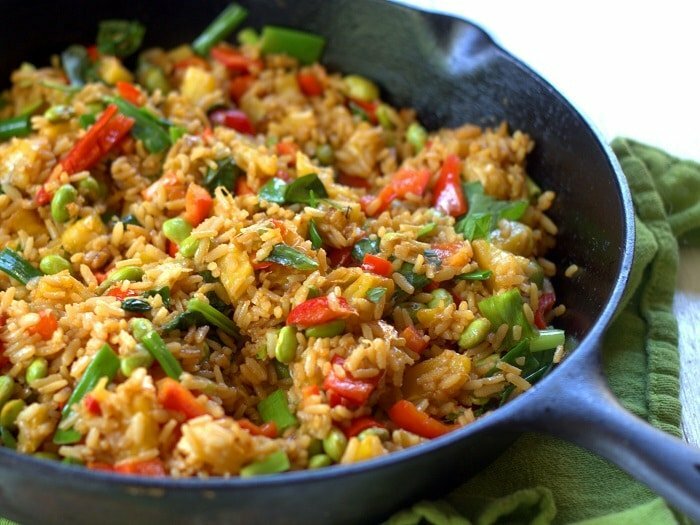 The best part: like, many fried rice dishes, this comes together super fast. Fifteen minutes, in fact, which leaves plenty of time for me to puzzle through my incomprehensible dinner scribbles. Place oil into large skillet and place over medium heat. Add white parts of scallions, garlic and ginger. Sauté about 1 minute. Add pineapple chunks and sauté until softened and browned in spots, about 5 minutes. Raise heat to high. Add rice, bell pepper, edamame, soy sauce or tamari and sriracha. Cook, flipping often, until rice begins to dry out and crisp in spots, about 5 minutes. Remove from heat. Stir in basil and green parts of scallions. Divide onto plates and sprinkle with peanuts. Serve. Oh my goodness, this sounds incredible and looks even better! 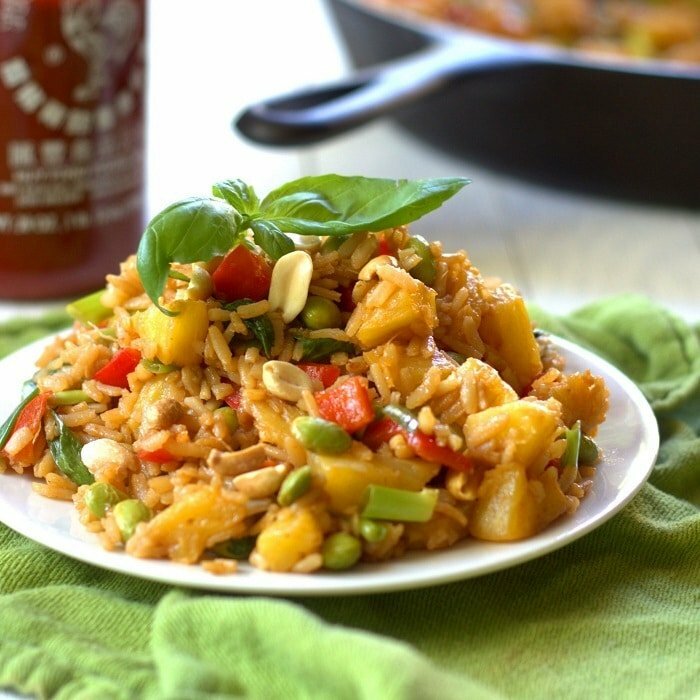 It looks very similar to the Khao Pad served at my favourite restaurant, which comes with a little wedge of lime and crushed peanuts – I’m getting hungry just thinking about it. I’ll definitely give this a go next week. I hope your hand feels better soon! Boo-hiss, it’s so disappointing when our bodies do janky-wierd things. Kudos to you for a little food healing! I have never tried pineapple and basil together, but you have sold me! Thanks Linda! You might have to tweak the recipe a bit, but I think quinoa would work. I have a quinoa fried rice recipe here that might be useful for guidance. Good luck! That’s an interesting combination of ingredients. Something I wouldn’t have tried before, but I am certainly tempted now. Especially edamame and pineapple. I like them separately, but together – interesting thought :) Thanks for sharing. It really was a nice combination – my husband and I LOVED it! Hope you do too! I’ m your friend from FBC. This looks delicious and I am glad that you are able to make this inspite if your painful hand .. This is wonderful, great recipe! 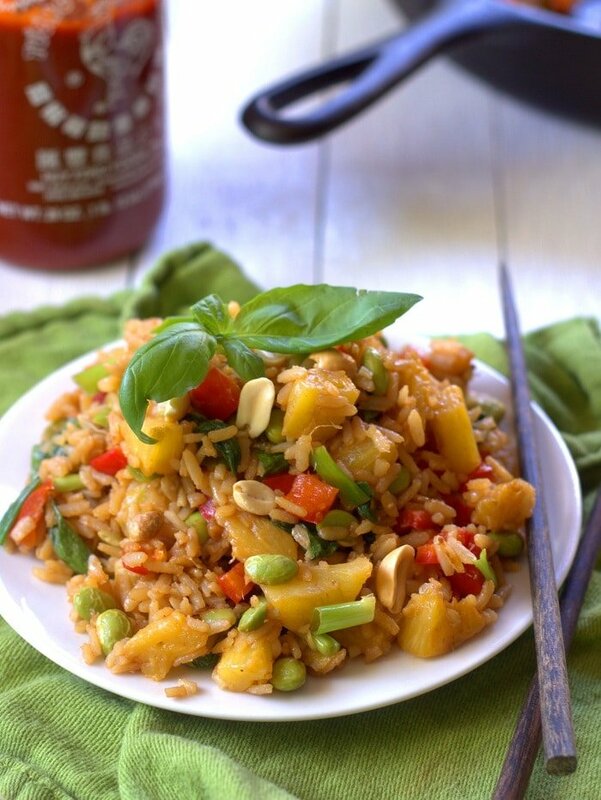 When I was in Vietnam I loved eating pineapple fried rice in a little place where they used half a pineapple as a bowl – maybe if I’m patient one day I’ll try that. :) Thanks for the recipe! Fantastic rice dish. Very tasty and tongue watery to eat. Awesome! Glad you liked it! Thanks for letting me know! Made this last night for the hubs and I. Absolutely delicious! Enjoyed every bite, and will be enjoying again tonight as leftovers. This will definitely become a staple in my dinner rotation. Thank you for sharing! Wonderful! So glad you enjoyed it! Thanks Robyn! I’m sure it would cook just fine with olive oil, but you might get a little bit of olive flavor in there. I love thai food. 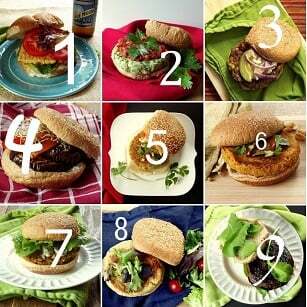 I made this recipe and it is verey delicious, easy and fun making. I have used sticky rice, basmati rice, brown rice and qunoa. Any grain you use it is always delicious. Thanks for sharing this recipe. Why would people would write comments without making the recipe? That does not help.